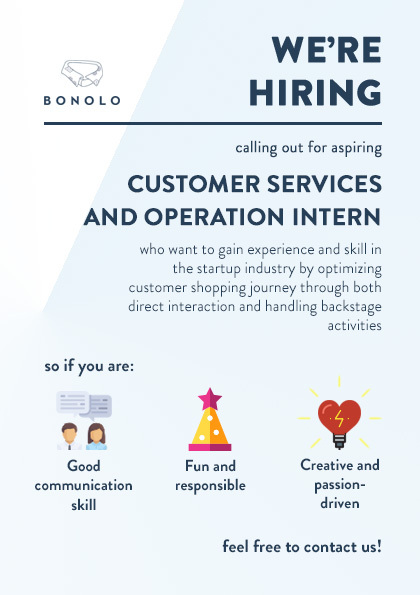 Hi, Bonolo is looking for passionate customer service and operation intern to optimise the shopping journey experience. Handling direct interaction as well as backstage activities to smooth the process from production, order, item delivered, to result WOW experience of the customers. As Bonolo focuses on experience of its customers, Bonolo believes that the fun, cheerful, and unexpected interaction from the customer service will be the key to leverage customer loyalty, specifically through remarkable service within Bonolo’s brand characteristics. 1. Handle questions coming through company’s phone, while infusing Bonolo’s value within the interaction. 2. Tackle the shopping journey process,(from making order, mdispatching order, to checking order delivered). 3. Measure the level of customer satisfaction. 4. Mining feedback and build close relationship with bonolo’s customer. 5. Organising customer’s data, as a strategy to develop customer loyalty activation. 6. Monitoring QC system to produce ideal products. 7. Formulate the number of stock and complimentary items to produce periodically. Description Bonolo is a new small venture offers a simple-stylish batik & tenun that “suit” you; either for work or whatever you wanted to do after . It comes from a gap between the needs, and the product in the market. Observation indicates that professionals & entrepreneurs (within young age) do not wear the Batik that fits their style and personality, while actually they are really style-conscious for their appearance for working. Bonolo catch the gap, where the product (design) in the market are not quite they truly wanted. Another main problem facing is the unpleasant experience for shopping batik & tenun. Bonolo aims to be a lifetsyle brand that offers batik & tenun that “suit” you, complete with remarkable customer experience.